Hardcover with jacket, 528 pages, 13.5 x 21.5 cm, 5.3 x 8.5 in. He is regarded as the "Marco Polo of the Orient": in the 14th century Ibn Battuta travelled through wide parts of the then known world, his path taking him from Morocco to Mecca and then on to Constantinople and Crimea and as far as Samarkand, India, Indonesia and China. In the accounts of his travels, the "King of all Travellers" describes Islam as a religion of progress and tolerance and as a bond uniting the countries he passes through. 700 years later, Erich Follath follows in the footsteps of Ibn Battuta, going through an Islamic world that has fundamentally changed. In twelve places important to Ibn Battuta, Follath impressively shows where the Islamic world stands today, the problems it is struggling with and the challenges it is facing. 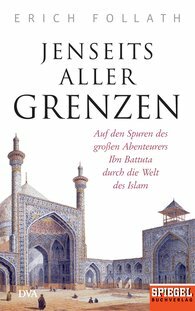 His book is a search for traces of one of the most enigmatic personalities of the Middle Ages, an investigation that both explains ancient sites and present-day political trouble spots and at the same time gives readers fascinating glimpses of the past and present in the world of Islam. "Erich Follath is one of the most brilliant contributors to the German press, writing as he does reports and analyses that in their knowledge of the subject and empathy are extremely rare."